Plaque commemorate the completion of the Copeton Dam in 1976. 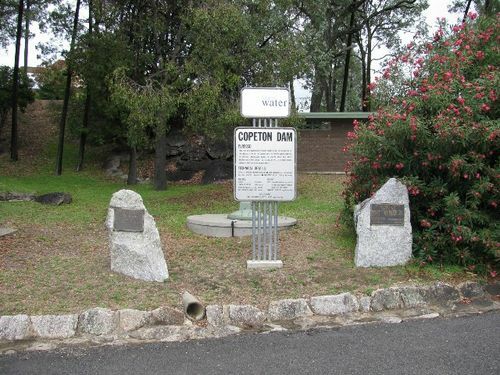 Commenced in March 1968, commissioned in 1973, and completed in 1976, the Copeton Dam is a major dam on the Gwydir River, a tributary of the Barwon River, and is located approximately 35 kilometres (22 mi) southwest of Inverell, between Bingara and Bundarra. The dam was built by the New South Wales Water Conservation & Irrigation Commission and the Department of Water Resources to supply water for irrigation. On The 23rd October 1976.